11 MILES SOUTH OF SAN FELIPE DOWNTOWN. COMMUNITY NAME: LOS SAHUAROS (KM 9 on HWY 5). VERY QUET, RELAXING AND EXCELLENT BEACH! 2100 sq. ft. home, 1 story, 3 bedrooms, 2 baths, 2 car garage, walking distance to the beautiful Los Sahuaros beach (150 - 200 m). Sleeps 6 adults plus 2 kids. 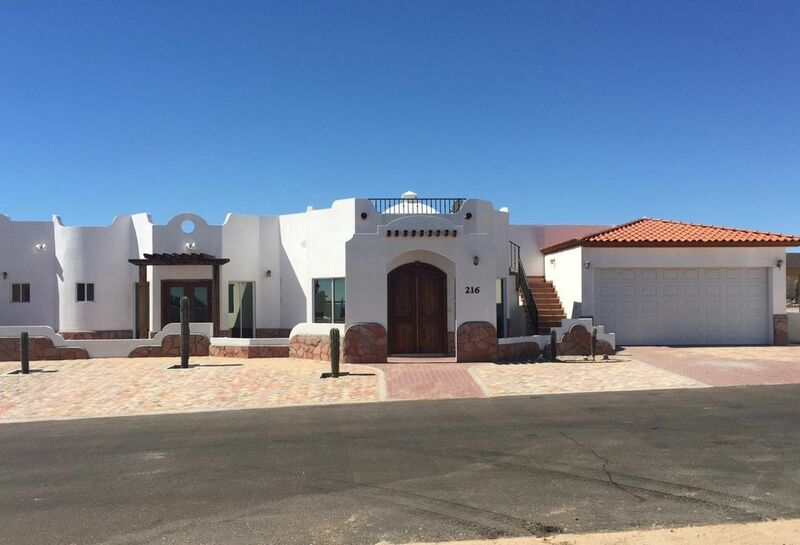 Located in the very desirable gated community of Los Sahuaros, with 24 hours security service and located about 10-11 miles south of San Felipe (km # 11). You can enjoy two pools, hot spa, tennis court and other amenities the community has to offer. This home has open floor plan with fully equipped kitchen, central air-conditioning. One of the bedrooms is the master suite. Master bedroom, kitchen and living room areas have mirror windows for the summer comfort. Activities and Attractions: Off-Road Vehicle, Fishing, Shopping. Restaurant with delicious and daily fresh sea food. Just 40 miles south from our community, in Puertositos, you can enjoy very unique natural hot springs. 5 miles south from our community you can drive through beautiful giant cactus reserve. Excellent fish restaurants. IMPORTANT: Only 6 adults and 2 children under 12 years of age are allowed to stay overnight at the house. A $25 fee per day will be collected for each additional person 12 years or older. A $15 fee will be charged for any additional children under the age of 12. This fee will be collected by our HOA security personnel during your stay at MLS. Additional guests between the hours of 8:00AM and 10:00PM are limited to 8 people. The fee for extra guests will be $25.00 and $15.00 respectively for adults and children. $250 reservation deposit is due at the time of booking. The full balance is due 3 weeks prior to your stay/reservation and 4 weeks days prior to holiday stays/reservation. Properties are subject to be released for re-booking if full payment has not been received within the said time frame. No refunds will be issued for reservations made less than 3 weeks/4 weeks for holidays, but the partial credit could be issued in case of serious family circumstances. Reservations cancelled prior to the 3 weeks/4 weeks for holidays will be assessed a $150 fee. Ocean View from the roof deck. Fully equipped Kitchen with all new appliances: Fridge, stove, microwave, coffee maker, dishes and silverware. Internet provided. Bedding is provided. Additional to bedroom beds have two full size futons in main living area. Air conditioning, Ceiling Fans. Cancellation policy: $250 reservation deposit is due at the time of booking. The full balance is due 3 weeks prior to your stay/reservation and 4 weeks days prior to holiday stays/reservation. Properties are subject to be released for re-booking if full payment has not been received within the said time frame. No refunds will be issued for reservations made less than 3 weeks/4 weeks for holidays, but the partial credit could be issued in case of serious family circumstances. Reservations cancelled prior to the 3 weeks/4 weeks for holidays will be assessed a $150 fee. This was our family's "end of summer" beach get away that included 6 adults and 4 children. The house was spacious enough to accommodate everyone comfortably. The open living/dining area had enough seating for everyone during meal times and was also comfortable for lounging indoors. The house was clean and in good condition. The rest of the community was well maintained and the staff was friendly and helpful. The community is secure with security staff making their rounds through the property regularly. Pool area was also well maintained. The beach was a short walk from the house, clean and peacefully quiet. Overall our experience was great and would definitely rent from Elena again in the future. I do have a few tips for anyone making the trip. As mentioned by others the house is approximately 20-30mins from the nearest supermarket. The road leading to the property from the main road is a bit rough so its best to stop in at the supermarket in the town of San Felipe before proceeding to the house. Also be sure to pack kitchen utencils, paper plates, dish soap, foil/plastic wrap or any other item which you may require if you plan on cooking. The kitchen was pretty bare bones and we found out the hard way. Also keep in mind that it can get very hot during the day so be sure to bring your board games and a deck of cards. We hope you enjoy your visit as much as our family did. Thanks Elena! Our stay at this lovely home was fantastic! The house is located about 15-20 minutes from the main town. It’s in a gated community which is a big plus. The community pool is just a few steps away which we completely loved. You could walk to the beach but honestly, if you are carrying chairs and umbrellas it’s best to drive to the gate which is really close by. The house is beautiful. Two ACs so the house remained nice and cool. A big plus for us was the washer and dryer. The owners are really nice as well. Overall this house was a great getaway for our little family. A great location to disconnect from the world and reconnect as a family. So I can't give a review of house 216 because the owner/manager Elena put us in house 215 when I booked 216. Nothing like switching houses and not letting the renter know. At first I thought the security guard gave us the wrong keys but then I looked at the paperwork she sent and it did say 215. Elena explained she had the two units, but no reason why she put us in a house we did not book. Besides that mishap, house 215 is nice. Plenty of seating for our family. No issues with the air conditioning, although it does run all day and night. The house was very cool. The kitchen was well stocked although we only stayed 2 days so we didn't do much of our own cooking. The pool is also directly across from house 215 so that was nice. The community is very nice and clean as well as the pool areas. The ocean water is amazing and warm. So many beautiful shells on the seashore. The beach is very private. We only shared the beach with a few other people, which was nice. All in all the stay was enjoyable and I would rent in this community again. A note to the manager would be to maybe provide some bath mats or additional towels for the floors in the bathrooms. One bathroom as no shower curtain and the whole floor gets wet when you shower. So we had to use our towels to soak it up. We did have a cricket in the house behind the cupboard in the kitchen that seemed to start chippering at night of course. Not really anything the manager can do about that. This was my 3rd year in a row coming to this property and I love it every time. The house is very nice with plenty of room and amenities. I especially love the rooftop deck for star gazing. The community is quiet, safe, and luxurious. The proximity to the beach is also fantastic. The beach is very nice with nobody around to bother you! The 2 pools and hot tub are also a nice perk! I highly recommend this property for families with kids. This community is clean and very safe. The sandy beach is very close and almost private. The water is warm and shallow. My 3 kids spent most of the time on the beach: swimming, body surfing, collecting shells and even fishing with their Grandpa. We spent sometime in San Felipe (20 min drive from the house). There are plenty of restaurants with outstanding but not expensive seafood and shops with local gifts. When we planed our vacation we were afraid that 2 weeks in isolated community are too much and we would be bored. But when it was time to leave nobody wanted wanted to. I have to say a few words about the owner, Elena. She is a very nice person. She returned all my calls and emails fast and explain everything in details. I was really impressed by how mach she cared about her guests. Thank you Elena for your hospitality! We loved this place. Roomy and spacious, with everything--kitchen, laundry, locked garage, hot showers, tv etc that we needed. The place is a minute from what is basically a private beach--miles of sand and hardly any other people. The home is dog friendly. which is a plus. Far enough from San Felipe for peace and quiet, close enough for meals. I would recommend this place to all. Owner is very quick to respond to e-mails. Mark, thank you very much for the review! We are very happy you enjoyed our house and San Felipe! Rates are subject to change until reservation is confirmed. Ask for the rates for holidays and local events. Cancelation policy: $250 reservation deposit is due at the time of booking. The full balance is due 3 weeks prior to your stay/reservation and 4 weeks days prior to holiday stays/reservation. Properties are subject to be released for re-booking if full payment has not been received within the said time frame. No refunds will be issued for reservations made less than 3 weeks/4 weeks for holidays, but the partial credit could be issued in case of serious family circumstances. Reservations cancelled prior to the 3 weeks/4 weeks for holidays will be assessed a $150 fee.